I sometimes publish here pieces which for any reason didn’t make it into the paper I write for, the Financial Times. This is not because I am so desperately proud of my own prose that I will publish it at any price, but that sometimes I feel that attention directed to a particular photographer (or photographic event or group…) will be valuable. This is certainly the case here. John Myers is a fine British photographer of great interest but precious little renown. He worked with originality and a deep appreciation of the photographic culture beyond his immediate circle, at a time when there was little institutional help for people of his stamp, and it is not much of an exaggeration to say that he has come close to being forgotten in the years since his major output. This was a review of a show earlier this year at the IKON gallery in Birmingham. A book – Middle England – was published at the same time by IKON, and it is a pleasure to acknowledge the scholarship, loyalty and hard work of Pete James and Jonathan Watkins (leading a group of others) who have managed to recover a reputation which might otherwise have been lost. I do feel that we in Britain are culpable in this regard. I can’t prove it, but it seems unthinkable that a photographer of the calibre of Myers could have been so largely overlooked in the Netherlands, in France, in Finland or Germany, in the United States… Paul Graham, in a modest and generous speech of acceptance of the Hasselblad Prize yesterday evening, spoke of photography passing through ‘wilderness years’ in Britain. He didn’t for one moment sound as though those years were over, either. We need to be careful. It is suprisingly easy for a photographer to become first hazy and then faint in public memory. Quite apart from the personal aspects of that, which are bad enough, there are also more general ones: if we can’t write and re-write our own photographic history by carefully looking at the precursors and pioneers, then we are in hock to those who are prepared to make the effort for their own. Photographic history has not been made in Britain in the last few years, but has had to be imported, from America for a long period, and now more recently from other places, too. Paul Graham, believe it or not, is the first British winner of the Hasselblad award. He moved to New York some years ago. Could he have won it had he stayed in Britain? In 1976, the Ikon gallery in Birmingham showed the high-speed stroboscopic photographs of the American scientist Harold Edgerton. Two lecturers from Stourbridge College of Art, Geoffrey Holt and John Myers, conceived the exhibition, and their aim was to show just how broad photography was, and just what wonders were to be found by exploring it. Now, more than thirty years later, something of the same kind has happened to Myers himself, whose first major exhibition opens at the Ikon gallery this week. An effort has had to be made to recover Myers. He was at one time a solidly visible artist. He was included in a major show of modern photography at the Serpentine Gallery in 1973, for example, and often appeared in the photo journals of the period, notably the specifically Birmingham-based Ten.8. But his list of publications and shows is almost completely blank for the 1990s and the 2000s. In the early 1970s, John Myers took a heavy 5 x 4 inch plate camera called a Gandolfi to photograph around the Midlands. Many years after light quick hand-held cameras had become the norm, he deliberately burdened himself with the slow patience that such equipment required. A family of interconnected series of pictures makes up Middle England, and behind them a complex of different views of photography. But that slow careful patience is at the root of them all. John Myers (born in 1944) was a teacher in an arts school art before it was yet certainly accepted that they would become homes for photography. He became one of the pioneers of a peculiarly British form of documentary which was just about the only kind of photography that could get Arts Council funding, and indeed Myers’ 1974 publication of some of the pictures seen here was one of the first photographic books to be so financed. We have forgotten just how much socially motivated photography there was at that time. There was a deep mulch of projects on urban decline, on changing patterns of employment, and on the appearance of the ‘new brutalism’. Some of it was conceived as journalism, or at least paid for by the colour supplements. Some was landscape work; more took the form of treatments of particular industries or towns. There were centres of concerned photography in numerous big cities: Newcastle, Liverpool, and York as well Birmingham. Strong work came out of each of them. In Birmingham alone, Derek Bishton and Vanley Burke and several others could each amply justify a retrospective on the scale of this one. A high proportion of today’s better-known photographers either made their practice in that period of documentary’s expansion, or learnt from those who had. Myers dropped very knowingly into this world where photography was a social tool. He knew his August Sander and his Atget and his Walker Evans and his Diane Arbus. He was familiar with the various types of photographic activity that would play themselves out in the documentary arena, and he quietly mixed them up. Portraiture was the heart of his practice, simple slow portraiture of the kinds of people who were missed by more generic image making. Non-fashion, non-advertising, non-reportage: just plain people seen in their own environments. Today much of the initial appeal of these portraits lies in the details of the clothing and décor of the period, the 1970s now as irrecoverably distant as the 1870s. Robert sat on his sofa in 1973 in co-respondent shoes with white laces, flared jeans, a V-neck and a cardigan of two violently contrasting patterns based on the lozenge. Even in black-and-white, the sofa’s geometric swirls competed loudly with some alternative geometry on the carpet. It’s easy to be po-faced about social photography, but there’s no harm in noticing that these pictures are droll to a later eye. Behind Robert, a guitar identifies his troubadour spirit (if his John Lennon specs haven’t done that already) and a book on Leonardo tucked into the crate-turned-bookshelf by his side tells us of his visual culture. He’s probably an art lecturer. Yet on either side, creeping determinedly into the picture, some ferny house plants point to the decorative taste of a landlady of a generation earlier. These portraits are far more than just a giggle, though. The scrupulous refusal of the photographer to exploit his sitters is very clear. Nobody’s taken by surprise, nobody satirized by an unfortunate juxtaposition or a chance moment made to seem typical. The sitters are participants in the slow business of the photograph, near-equal partners in an approach to self-portraiture. Yet the photographer remains firmly in charge, presenting to us a world of people who don’t really know how to present themselves. Had they been seen in the magazines, these would have had just as much effect as Arbus. They’re unsettling, discomfiting in a British understated way. The other series than portraits add a lot to that feeling of instability. A set mainly of landscapes is called Boring Photos. They’re not boring at all, of course. They are an early but scrupulously well-crafted black-and-white precursor of that study of non-spaces which has become so much more common in colour. They owe something to American photography, but are not slavish copies at all. They have glorious titles: Lift Doors Waitrose 1975 or Factory Forecourt 1974. They’re clear antecedents to Martin Parr’s famous book of Boring Postcards, and they had just as much knowingness about them, even when they were made. 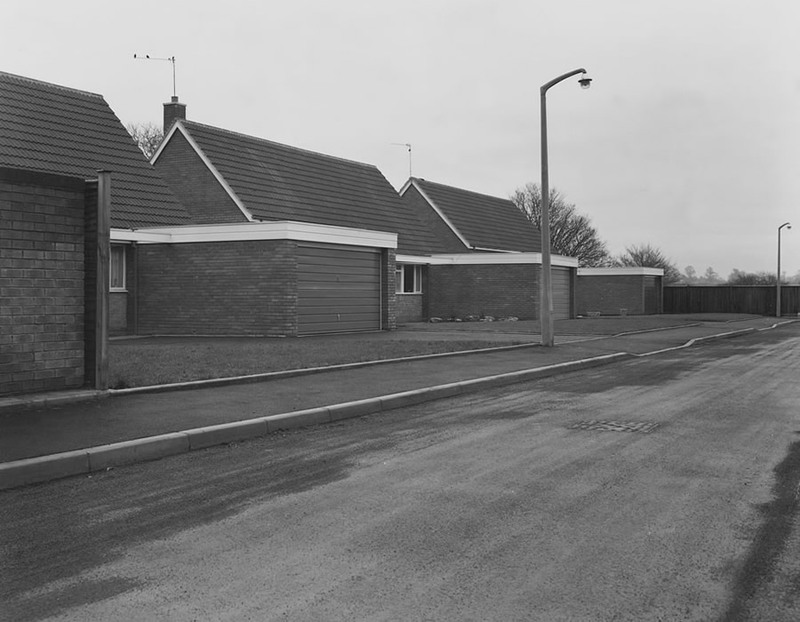 Other series look at the components of those landscapes in detail: Houses are just that, tidy houses which look superficially so much more liveable than the tenements of a previous generation’s photography but which have somehow lost all their people. A set of Substations invite the eye to linger on an architectural type which although never secret had never really been seen. A few pictures of the inside of a furniture store in New Street, Birmingham, in 1974, make a stage-set of aspiration. British people will expect a high-period Tony Blackburn to appear in these, simpering and drooling over the classlessness of it all, although Myers put nobody in them at all. Finally, the exhibition includes a very fine group of Myers’ studies of televisions in the corner of living rooms. 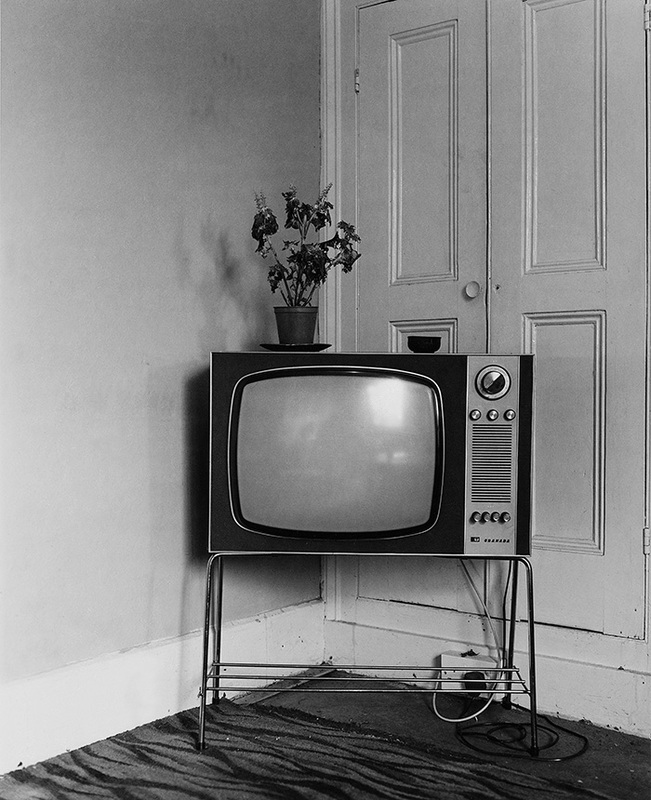 Unlike Lee Friedlander’s more famous TVs, these are seen switched off, and often reflect the photographer at work. They don’t fit properly in the rooms they occupy. People put plants on them, or try to treat them as just another ‘surface’, or give them fancy space age stands. In modern jargon, these add up to a typology, although you could just as well call them a collection of shots of TVs. They’re prescient of the uncomfortable way that screens have taken over our lives. They’re witty, scrupulous, well seen and well made. Myers is quite plainly a first-rate photographer. It’s nice to have him back.